It has long been appreciated that there is something about the human brain that makes it unique amongst other primates and mammals in general. Dr. Greg Downey and Dr. Daniel Lende explore how and why the human brain has evolved the way that it has in Chapter 4 of The Encultured Brain: An Introduction to Neuroanthropology. The authors are well-qualified to provide an overview on this topic as both have a wealth of publications in this area, as well as being leaders in the development of the field of Neuroanthropology. What makes a human brain unique? Is it simply the sheer size of it? Well, no. Anyone who has visited the American Museum of Natural History in New York City can clearly see that the enormous blue whale hanging from the ceiling has a brain much larger in size than that of a human’s. Perhaps the issue is not sheer size then, but the size relative to one’s own body. Unfortunately, we once again do not have a satisfactory explanation for human’s unique cognitive capabilities. While looking at relative size does work to explain the blue whale example (a blue whale’s brain only accounts for 0.01% of its body’s mass while a human brain accounts for 2%) we see other species that are an exception to this rule. For instance, a pocket mouse has a brain that comprises 10% of their body mass, much more than that of a human and yet we don’t see the unique functionality of a human brain expressed in a mouse. However, when we turn instead to the encephalization quotient (i.e. the ratio of predicted brain mass to observed brain mass) we see that humans do stand out in this respect. In fact, humans exhibit an encephalization quotient that is between five to seven times higher than what is predicted for a mammal of our size. While greater encephalization is found across primates, humans are still an outlier and it appears this has been true for quite some time. Around two million years ago the genus Homo appears and with it we see a tripling in brain size in our ancestors as compared to other apes. However, it is not just the increase in size that is notable here–brain organization is a key component in better understanding our cognitive evolution. So, do humans simply have brains that have a ton of new structures that other primates don’t possess? This is once again an incorrect assumption. Rather than humans and primates differing in existing regions of the brain, our current evidence suggests that the differences are actually proportional which has fascinating implications for our evolutionary understanding of cognitive function. Instead of evolving new structures, it appears that humans have modified or repurposed existing structures so that certain brain regions have expanded at a different rate than others. This evolutionary trade-off has resulted in decreased development in areas like the human olfactory bulb, while structures like the cerebellum which is involved in frontal lobe functioning has shown great expansion. In addition to size and structure changing across evolutionary time, connections among regions of the brain have also seen significant changes. In particular, we have seen an increase in the total number of neurons and with this, we see that larger brains tend to develop areas that are increasingly independent or modular which requires an increase in white connective matter. Understanding the brain’s connectivity is likely a key component of understanding human consciousness. Further, many researchers are now emphasizing the failure of previous metaphors such as the brain being “hard-wired” which does not capture the way in which brains are shaped through interactions and development (i.e. “wet-wired”). To better understand how it is that experiences help shape the brain, Downey and Lende draw on the concept of niche construction which emphasizes the role that organisms play in shaping their own environment and subsequent selective pressures. The authors argue that niche construction provides a place for cultural researchers within evolutionary studies–an interdisciplinary relationship that is too rarely created. This relationship is absolutely necessary since an understanding of human “intelligence” cannot be obtained by looking simply at the size and structure of the brain. Rather, we must also consider how our social relationships allow us to transfer and amass all of the components that we regard as forms of “intelligence” (e.g., technology, skills, information). Moreover, the authors emphasize how emotions, motivation, and perception are all factors that play into our social and cultural complexity and, thus, cognitive evolution. Powerful, but overly simple, models of evolution that assume evolutionary traits will necessarily result in human universals need to give way, not to erase evolutionary explanations, but to provide richer accounts that incorporate data emerging from genetics, paleoanthropology, comparative neuroscience, and anthropology, including research on human diversity (p. 124). The lead author for this paper is Dr. Joshua Balsters whose research interests are in the area of social and emotional decision making. While not covered in the article, Dr. Balsters states that his specific interest is in Autism Spectrum Conditions (ASC) which he studies using a combination of fMRI, EEG, and computational modeling. At the broadest level, the researchers are interested in whether the process of brain evolution is mosaic (i.e. evolutionary pressures act on individual neural structures) or concerted (i.e. evolution acts on interconnected parts of the brain that comprise whole functional systems). To test this, the researchers examine the cortico-cerebellar system in three different primate species: humans, chimpanzees, and capuchin monkeys. The study consisted of obtaining high-resolution MRI scans from 10 primates from each of the previously mentioned species (5 females and 5 males). All of the included primates had either reached sexual maturity or were close. The researchers were able to isolate the cerebellum and examine the lobules related to the primary motor cortex and the prefrontal cortex. The data demonstrate that the lobules related to motor and prefrontal cortex occupy a greater proportion of the human cerebellum (83.87%) as compared to chimpanzees (67.1%) and capuchin monkeys (56.82%). Moreover, the results show that where there were increases in the prefrontal cortex, there were proportional decreases in the motor cortex. Since the volume of areas of the prefrontal cortex increased relative to cerebellar lobules connected to the motor cortex, these data suggest that these associated functional systems evolved together. This study provides support for the idea that brain systems evolve in a concerted fashion. The results from this study are important as they suggest a potential route to find clues regarding the evolutionary pressures that may have contributed to various expansions in the brain. Additionally, this research demonstrates how comparative MRI can be utilized to examine differences across primates. I was able to somewhat follow the methodology of this study; however, I found myself both intrigued and somewhat intimidated by what I couldn’t grasp. This makes me wonder about some of the practical issues with interdisciplinary collaboration. I loved Downey and Lende’s description of how cultural researchers could and should be involved in evolutionary research, but there will likely be some limitations to this collaboration. In many ways, Balsters et al. (2009) is speaking a different language with words and acronyms that will have no meaning to someone who is not well-versed in the cognitive literature. Even simply grasping the hypothesis or overall finding for the study would likely be quite difficult for someone outside the field to grasp. Here is our challenge: if we were to reduce the complexity of the article, perhaps more researchers could understand the results; contrastly, researchers most likely to utilize this study will need a detailed report of the methodology and results in order to replicate or expand on this study. How do we find this balance? How would our understanding of human brain evolution be different if we didn’t consider it in terms of niche construction? In light of new ideas regarding “dual-inheritance,” what are some reasons why anthropologists might be uniquely qualified to examine human cognitive evolution? How might we define “culture” in evolutionary terms? With the full acknowledgement that there is very likely more than one explanation for human brain encephalization, what is your favorite theory for why humans evolved such large and complex brains? How can we encourage interdisciplinary research when each field has their own “language”? The old image of a human evolving from an ape by gradually getting more upright is a common way to portray the concept of evolution, even though the imagery portrays a slightly incorrect concept: humans did not evolve “from apes,” modern day humans and modern day non-human primates evolved from a common ancestor. While this distinction may seem semantic, it’s important to note because the study of modern non-human primates is not quite exactly the same as peering back into our own evolutionary history. It can, however, still offer incredible insights into the overall evolution of our species, especially when it comes to cognition and learning, and offers clues as to how our species’ brain evolved the way it did. That is, studying cognition across the Primate order can provide a framework for understanding cognitive functioning and evolution. One of the key commonalities all primates share is a dependence on close social relationships for support with security, food resources, and child rearing (MacKinnon and Fuentes 2012). Living in stable social groups allowed early primates to be able to deal with threats more efficiently. This lead to changes in the environment, such as, among other things, predators deciding to go after other pray. As threats lessened as a result of the adaptation of social groups, primates were then able to spend more time and energy in building social relationships, exploring territory, and experimenting with different foraging strategies (MacKinnon and Fuentes 2012). All of this lead to primates both requiring and having the opportunity to increase cognitive functioning. In this way, primates shaped their environment and were in turn shaped by the changing environment. This concept is called niche construction—primates created a niche for themselves in their environment that shaped both the environment and their evolution. This concept illuminates some of the intricacies involved in understanding evolution: the model of organisms merely adapting to their environments for the purpose of survival doesn’t quite capture the complexity involved. Human niche construction and evolution, specifically, depended upon an increasingly sophisticated way of interacting with the environment. With the use of more tools, better survivability rates for infants, and increasingly complex methods of communication, early humans were able to efficiently increase their territory and cooperate within and among groups. The success of these adaptations meant more resources, and the conditions were fertile for the evolution of human cognition. This chapter gives a good, easy to understand overview of the evolution of primate cognition, and makes a good case for the purpose of studying primate cognition in neuroanthropology. Of course, as an overview it ends up lacking in some specificity of the concepts covered, but the following articles address some of the more important areas more in-depth. The increasingly social nature of primates, as well as the increasing complexity of interactions with the environment, lead to an increase in the types of interactions and concepts that needed to be exchanged. To put it another way, the complexity of interactions increased. This is the basic idea behind the social brain hypothesis, which says that brain size, specifically the neocortex, is correlated with not just group size but the complexity of relationships within a social group (Dunbar and Shultz 2007). Some examples of complex social interactions necessary for survival in large groups that primates exhibit that require higher cognitive functioning include tactical deception, social play, and the use of subtle social strategies (Dunbar and Shultz 2007). The increase in neocortex size does not come without some tradeoffs, however: diet, infant care, and development have all shifted to account for the change in brain size necessitated by and necessary for increasingly complex social interactions. This article is a thorough examination of the variables at stake in understanding the evolution of primate cognition. However, the statistical analyses and language used make it unapproachable for a casual reader. The previous piece covers the subject material in a more approachable way, though certainly doesn’t go into the depth of what’s involved in the social brain hypothesis. Complex social interactions like the ones required for primate survival, and that lead to the evolved human brain, needed to have been passed down from generation to generation in order to be evolutionary. One primary way learning of this kind takes place is through social play. Play is, in terms of survival, both costly and risky, which means that it likely has significant adaptive value (Konner 2010). As it turns out, the smartest animals are the ones that play the most, and it’s likely these two things co-evolved (Konner 2010). Interestingly, while the size of the neocortex is associated with intelligence and social complexity, the capacity for play appears to be housed in the limbic system, an older and more primitive part of the brain; however, animals with larger brains do play more and the animals with the largest brains play the most (Konner 2010), perhaps reflecting the increased complexity of the learning that needs to occur. For more information on the regions of the brain, see Kalat (2012). While the process is not fully understood, social learning, unlike basic learning processes, likely takes place due imitative learning, assisted by the mirror-neuron system (MNS; Konner 2010). The MNS activates not only when one observes an action, but also right before an action is taken, which suggests that there is a link to the ability to perceive the intentions of others (Konner 2010). This chapter comes from a book on childhood and development, so this chapter on social play doesn’t quite go into the specific depth that we might be interested in as neuroanthropologists, especially the neurobiology of social learning. While the mirror-neuron system is interesting and an exciting step toward understanding, its treatment is rather shallow and other systems aren’t included in the explanation. While the above articles explain in varying degrees of accessibility the arguments for the evolutionary path of human cognition, they don’t go into much detail about the cognitive capabilities of our primate ancestors. Understanding the extent of primate cognition could help to understand the capabilities that primates had, prehistorically, that could contribute to and be shaped by their social complexity. According to Beran et al. (2016), controlled attention, episodic and prospective memory, metacognition, and delay of gratification have all been observed in chimpanzees. Non-human primates don’t match the cognitive abilities of humans in these areas, but their presence sheds light on the potential cognitive capabilities of our primate ancestors. Of course, it needs to be kept in mind that their study was done in a controlled laboratory setting with a modern chimpanzee, so the results would be different than a wild primate ancestor. The scope of research included in this paper is impressive. Each component of cognition is tested well, with good results. While it is a psychology-oriented paper, more discussion of the implications for the understanding of primate evolution would have been welcome. Additionally, there isn’t any discussion of how these cognitive capabilities would be expressed in natural settings. What is niche construction, and how does it relate to our understanding of evolution? Can you think of any other examples of it? What is the social brain hypothesis, and how does it relate to the evolution of the brain? What lines of evidence do we have that support this hypothesis? How do modern advancements in technology alter the way we think about “play” as it relates to social learning? What do you think about the understanding of gender in play relationships described in Konner’s article? Beran, Michael J., Charles R. Menzel, Audrey E. Parrish, et al. 2016 Primate Cognition: Attention, Episodic Memory, Prospective Memory, Self-Control, and Metacognition as Examples of Cognitive Control in Nonhuman Primates. Wiley Interdisciplinary Reviews: Cognitive Science 7(5): 294–316. 2007 Understanding Primate Brain Evolution. Philosophical Transactions of the Royal Society B: Biological Sciences 362(1480): 649–658. 2012 Biological Psychology. Cengage Learning. 2010 The Evolution of Childhood: Relationships, Emotion, Mind. Harvard University Press. Lende, Daniel H., and Greg Downey, eds. 2012 The Encultured Brain: An Introduction to Neuroanthropology. Cambridge, Mass: The MIT Press. I have enjoyed cooking since I was little watching my mom cook as I stood by on a step stool. Cooking and baking allow me to take seemingly random ingredients, form them together, and make something (usually) tasty. It has always been exciting to me to find new recipes and make them while adding my own touches. Cooking allows me to be expressive and creative while also serving a vital purpose, which is to feed myself. I began taking an interesting in cooking because I enjoyed being in the kitchen with my mom. As I grew older and more capable, I was expected to be able to contribute to making meals for the family. It became important to me to learn to cook properly so that I could make meals my family would enjoy eating. Cooking brought me joy and eating yummy food was always a plus. I have been involved with cooking for a little over a decade, always casually, but in that time I have learned a lot. As I have grown older I have become more focused on trying to cook healthier while still enjoyable meals. I have learned a lot about portions, what foods are best for feeling full, and foods that give more energy. I have also gotten much better at not accidentally harming myself in the kitchen. The more I am able to learn about different foods and methods for cooking the more I am able to change and adapt the way I cook. Cooking serves an important function in my life. Feeding myself allows me to be alive and function on a day to day. Since I have educated myself on what foods are best, I can optimize my daily routine by ensuring that I feel good and have lots of energy. Not to mention that today, it is generally cheaper and healthier to cook at home so being able to cook also aids me in that way. One could say that humans and their ancestors have been cooking ever fire was tamable, proposed to date back to Homo erectus. Putting raw meat over fire and eating it may be simplistic but it certainly counts. Some scholars such as Richard Wrangham have asserted that cooking raw meat and eating it cooked instead of raw allowed for the human brain to develop greater than before. Cooking has continued to progress as humans learned how to use more tools and as they moved across the globe, trading goods with one another. My ability to cook even something as simple as a roast with potatoes and carrots would not be possible without our past ancestors drive to explore and the exchange of goods across the world. Hello, my name is Megan Hill and I am an aspiring biological anthropologist who has found herself enrolled in this one of a kind course at the best university in the South (Roll Tide). Two major parts of my childhood are the prime influences for the topic of this post today. The first one is that while I was growing up, my mom and I would stay up late watching true crime shows such as forensic files, snapped, and cold case files. These shows had a major impact on how I saw the world and ended up shaping the kind of person that I would be. No I don’t mean that I’m a psycho who’s obsessed with death or anything like that. I mean that I wasn’t easily scared or grossed out by blood or the mere idea of death. I saw the field of forensics and homicide investigation as incredibly necessary and deeply fascinating. I knew from a relatively young age that I wanted to go into the criminal justice field. I later refined my dream job down to that of forensic science, then later to the idea of a career in forensic anthropology. I absolutely love the human body and the process to determining what happened to it that resulted in the death of that particular person. The second major part of my childhood that influenced this post is that my grandmother taught me how to knit when I was 8 years-old. I grew up knitting scarves, pot holders, blankets, and sweaters. This is a skill not most teenagers that I knew possessed. Despite all of the time my friends spent playfully tease me about my “old lady” hobby, I’m glad that I learned how to knit when I did. I learned how to knit because my dad expressed a strong desire for me to learn. His nagging elicited action from my grandmother to reach out to me and offer to teach me. I like to think that this hobby does help me to survive. I am able to use it to make clothes to keep myself and my close friends and family warm throughout the cold winter months. Funny story, almost 2 years ago, I began working on a sweater for my 6’6″ boyfriend who lives in Boston. I still have not finished this sweater because it has required a lot of work from me and as a college student I have not had the time to devote to finishing this sweater. When I was 8 and I first learned how to knit, I was awful at it. There were holes all throughout the project and there were different yarn tensions from where I didn’t know how to hold the yarn as I was knitting it. However, as I got older and I kept practicing, the holes got smaller until there were no more holes in my work. I also learned how to keep consistent tension on the yarn throughout the entire project. Eventually all of my projects looked about the same to one another, I mean other than one looks like a scarf and one looks like a sweater but I’m sure you know what I mean. Hi, I’m Kat, and I spend a lot of time thinking about art and sociocognitive theory. I’ve been painting and drawing since I was very, very small. It used to be one of the first things people learned about me, but now it’s one of the last. I see art as intrinsically tied to science, which may be why I took so much of both in college. To me, understanding one helps you understand the other. I like making things that make people feel things. To me, the art in itself is the transmission of feeling the object elicits. Synapses firing gracefully, elevated, as your eyes cross the surface of the painting, studying the peaks and waves. The things I tend to make are a combination of elegant and visceral. I think about why we’re driven to create things with little purpose except decoration, and perhaps narration. And why I, specifically, am driven to create, and can with some degree of proficiency. I made this in high school. My professors liked to describe this style as “ugly beauty”. So, as with everything, we can investigate these quandaries with some degree of modality. Four questions, four answers. Causation – This is perhaps the most difficult question to answer. Whether talent is heritable is still up in the air amongst most people. It’s interesting, surely. Jeremy Summers of the Genetic Literacy Project postulates, from a few studies, that artistic ability can be linked to a few things. One is the release of serotonin, albeit not necessarily the inherent presence of it. 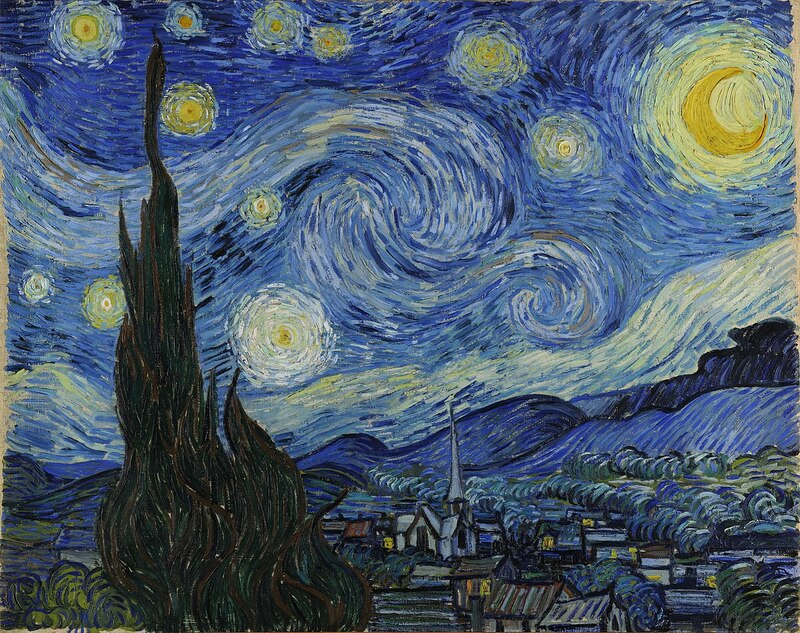 Many artists have been famously depressed, the most famous probably being Vincent Van Gough. This is something else we share. My work, itself, improves when my mood does. Some of Van Gough’s greatest work was done during his stay in the Saint Paul-de-Mausole mental hospital, including Irises, and the one we all know, Starry Night. Another link to creativity is, strangely, a shorter bundled strand of fibers in the corpus callosum. The theory here is that it allows for access to both sides of the brain through a shorter path, allowing for a faster and more effective flow of ideas. Ontogeny– This one is easy enough to answer. As I grew older, I was better exposed to drawings. My mother is extremely creative, and would always shower our house with fresh flowers and coats of paint. She was the first person that taught me to draw. I have had many teachers in my life that have lended me advice and helped to increase my vocabulary of form. Phylogeny– People make art for many reasons. They make it to hold record, as with Egyptian Hieroglyphics, to record their very presence in this world among many. They make it to communicate ideas, and make others feel things- at least I do. Some of the oldest pieces of recorded art are hand stencils on the walls of caves in Spain. Handprints from the Cueva de las Manos, Spain. Art has also been used as a plea to the gods, or a ritualistic object. Which brings me into the final question. Adaptive Value – I couldn’t possibly talk about science and prehistoric art without mentioning Mr. Vilayanur S. Ramachandran, a Neuroscientist and Art Historian who speaks about a number of artistic principles in relation to human survival and chemistry. In artistic objects as early as the Venus of Willendorf, Ramachandran talks about a “peak shift”- a change in behavioral response through what is deemed necessary for a species’ survival. 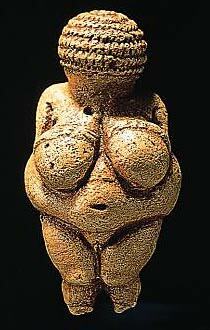 The venus is one of the earliest examples of art in existence, made around 30,000 BCE. Found in the icy mountain ranges of Austria, its exaggerated curvature suggests the ideal female form in an environment of scarce resource. This shift occurred precisely due to what was seen as fertile, and thereby idealized in this way. It was thought to hold importance as an object of fertility. The same can be said for more modern art, as well. While not in the same realm of magical thinking, exactly, it does play on some sensory skill developed in early human society, such as grouping and perception. Whether an object of religious significance, cultural commentary, or pure, unadulterated aestheticism, I believe it’s important to create. For both audience and viewer. Humans have always created, and I hope they always continue to. Myself included. Me, exploring the bald face of a mountain in South Carolina. I was on my way to my first backpacking trip with a friend. In the woods just the two of us for three days wasn’t easy, but we got an amazing spot for the solar eclipse this year! Hi, I’m Lauren and I’m always trying to push my own limits. I’m a senior working towards a B.S. in Psychology with minors in music and philosophy with a mind and brain concentration. My whole life is dedicated to making myself uncomfortable, because that’s how we grow as people. In high school, I was really shy and awkward and trying to blend in as much as possible. Really nothing special and really ok with it. But one day my band director (the whole shy and awkward thing definitely lends itself to being a band nerd, trust me) bestowed on all of us some wisdom that I will abide by for the rest of my awkward and extraordinary life: Get comfortable being uncomfortable. I’m pretty sure he was talking about becoming a better soloist or something at least semi-music related– but that’s not how I heard it. It came at a time my senior year when I was deciding what college to go to– in-state or out-of-state, big school or small school, public or private. And I needed to hear something that would help me make this decision that I knew would help shape the rest of my life. Which brought me to The University of Alabama! And this mantra has been going through my head since I stepped foot onto campus back in August of 2014. Me, circa 2013. Marching down Broadway in the Thanksgiving Day Parade. Can you tell which one I am? Exactly. These words of wisdom grant me a cause to push myself. It’s the only way I’ve figured out to be my best self, to stay busy, and to reach my full potential. There’s always more that I can do and I like to be able to prove that to myself. It probably comes from my competitive nature– I always like to “win”, and if winning is doing something different than I did yesterday then that’s cause enough for me to try it! Pushing myself like this is definitely a learned behavior. It’s something I work towards every single day. Whether it’s pushing myself to set up a one on one meeting with a professor (which gives me incredible amounts of anxiety), starting an independent research project, or running for club president, I’m definitely not predisposed to do any of these things. But day after day I find myself pushing to make something happen. I’ve learned to overcome the butterflies in my stomach before every lab meeting and test review. I’ve retrained myself to embrace the jitters that come along with submitting a research proposal. Some argue that this feeling is an evolutionary mechanism designed to make you run away. I’ve retrained myself to run towards it. This behavior definitely has allllll kinds of adaptive value. I mean, I’m always adapting to the new adventures I throw myself into. Spring semester of freshman year I tried out to be a coxswain for the Alabama Crew Club. No big deal, right? anyone can sit in the back of a boat and steer it. WRONG. I was so wrong. When I showed up (at 5 am), expecting to be one of several people hoping to make the team. Turns out, I was trying out to be a coxswain of the men’s team. And crew=rowing (something I only had a slight idea of when I showed up). But I was there. I sat in the boat and steered it down and back up the river. And at the end of practice (the sun had just risen because it was still only 7 am) they told me to read up about what I was doing and they’d see me the following morning! I had to adapt to be more social, to gain confidence, and to fill a leadership role overnight. And I’m sure that increasing the males around me by 400% definitely has the chance to increase reproductive success, statistically at least. Alabama Crew Club Men’s 8+ after winning bronze at a regatta in Gainesville, GA this spring. I don’t think this kind of behavior is an evolutionary trait– I think it’s a socially developed trait. Maybe there are some people who can push themselves naturally all the time (maybe they’re called extroverts? ), but I am not like that. Maybe that truly is how some people get ahead and become CEOs or Senators or other models of “successful people”. But in my personal experience, this is a trait that derives from necessity, not from actual innate drive. Me, standing in front of an Atlas V rocket just hours before launch. I got to watch this rocket launch the OSIRIS-REx payload into space. Ask me about it some time. It’s really strange to think about yourself in terms of evolutionary adaptations. As a psychology major with a focus on brain studies, it’s something I’ve never had to do before. It’s definitely beneficial to examine yourself in terms of how you go about daily life. As a psych major we’re always told things like, “now don’t try to analyze yourself in this way, you’ll just think you’re a psychopath!” and other ridiculous things about the parallels we may start to see in ourselves and our friends to the disorders we learn about in abnormal psych classes. I think this gives a really nice reflective perspective to how we see ourselves in the context of our classmates and in a broader context, too. The concept of flow, pioneered by psychologist Mihály Csíkszentmihályi, is a state in which an individual is focused and fully absorbed in some task, generally one that is both challenging and rewarding (2014). Organized by Tinbergen’s four questions, there are a number of reasons why behaviors leading to a flow experience are important for humans. Modern life has multifarious forms of stress–physical, environmental, psychological, and social–that bombard the individual constantly. As Robert Sapolsky discusses in Why Zebras Don’t Get Ulcers (2004), modern stressors might even cause a higher burden of stress than our ancestors may have had. In the face of these stressors, we need ways to help deal. Flow, and other states that take us out of our normal patterns of thinking, can help to alleviate some of the burden associated with constant stressors (see Lynn 2005). During a flow experience, like flying down a snowy mountain at 50mph, the mind is focused only on the immediate. Stress falls away, and is lessened after the experience as well. What is now an adaptive trait for helping to deal with the stresses of the modern world has a long evolutionary history as well. The “living in the moment” feeling associated with flow, and the hyper-focus and skill that comes from it, would have been necessary for hunting and fighting. Those able to “turn off” their brains to focus fully on the task at hand, especially in dangerous, self- and community-threatening situations, would have been selected for over those who weren’t. Flow experiences likely occur through cognitive mechanisms that help to stem the tide of an otherwise overwhelming amount of information in dangerous or threatening situations. Energy and attention go only to the absolutely necessary functions required for action in the moment: it’s not helpful to be worried about that thing your girlfriend said when an enemy is swinging a club at your head. While the exact biomechanics of flow (and other dissociative states) are not fully understood, a gene, designated catechol O-methyltransferase, or COMT, has been identified that is a candidate for contributing to an individual’s propensity for absorption–a necessary component of flow. The presence of a gene that contributes to one’s ability to enter and maintain a state of flow suggests that this is a crucial aspect of the human experience that has been consistently selected for. You can flow down mountains in whatever manner suits you (or accidents force you to). 2014 Flow and the Foundations of Positive Psychology: The Collected Works of Mihaly Csikszentmihalyi. Dordrecht: Springer Netherlands. 2004 Hypnotic Susceptibility: Multidimensional Relationships with Cloninger’s Tridimensional Personality Questionnaire, COMT Polymorphisms, Absorption, and Attentional Characteristics. International Journal of Clinical and Experimental Hypnosis 52(1): 47–72. 2005 Adaptive and Maladaptive Dissociation: An Epidemiological and Anthropological Comparison and Proposition for an Expanded Dissociation Model. Anthropology of Consciousness 16(2): 16–49. 2004 Why Zebras Don’t Get Ulcers / Robert M. Sapolsky. 3rd ed. New York: Times Books. Hello, my name is Abbie, and I’m a senior at UA. I’m majoring in Biology and Spanish with a minor in Anthropology. My hobbies tend to lean more towards the arts: playing flute, painting, drawing, and perhaps the least popular amongst our age group, sculpting with Play-Doh. Commonly thought of as an easy arts and crafts activity for young children, using play-doh has quickly become a valuable hobby as I’ve grown older. Opposite to most, I seem to have grown into this habit instead of abandoning it with age. I find that it has stress-relieving and relaxing properties and provides a creative outlet to relieve any frustrations or anxieties. Juxtaposition of my Play-Doh nature with real nature. This particular hobby had a fairly uneventful beginning. Walking through a Target store one day, I walked by a display of Play-Doh and spontaneously decided to purchase a few tubs, recalling how much I enjoyed it as a kid. That night happened to be in the middle of midterm exams, and it was particularly stressful as I had several exams that week. During a study break, I picked up one of the tubs and just began rolling the dough around, not making any intentional shapes, instead using it as “stress ball” of sorts. This became a habit of mine while on study breaks to help relieve stress about upcoming exams. Eventually, I began using it while studying, much like the fidget cubes that many individuals use today, using it not only to eliminate anxiety but also to better my focus. It quickly became a more frequent pastime, not only using it as a stress ball, but also beginning to make pictures and shapes (though unrecognizable to others). I began carrying Play-Doh around with me in my back-pack, on short trips, and even on a summer long vacation out of state. I now use it almost daily to rid myself of any of the frustrations induced by the day’s events. It has rather quickly evolved into one of my most relaxing and beneficial hobbies, and my Play-Doh collection has grown significantly since its beginning. It’s no Pyramid of Giza, but it is a work in progress. Humans have utilized sculpture as an art form for centuries, though, most did it for different reasons than my own, citing religion and mythology as a common influence and model for their creations. Many also used it as a form of recreation, and this habit seems to have been passed down through generations. Though our prehistoric ancestors likely weren’t using brightly colored salt dough, sculpture as a hobby is not a new concept. A more time consuming creation made during a Harry Potter movie marathon. Though not directly responsible for increased survival chance, playing with Play-Doh does provide a group of advantageous traits that could be useful in a survival circumstance. Playing with Play-Doh not only reduces my stress levels, but also has increased my creativity and imagination. Creativity could prove useful as a potential problem-solving trait, which could potentially improve my overall ‘fitness’ as an individual. It can even be used to improve fine motor skills, depending on how detailed one’s creations become. Monika Wanis – Why I like extreme sports! Mechanism – Physiologically, extreme sports often involve behaviors that increase your heart rate and produce a surge in hormones such as cortisol and adrenaline and neurotransmitters such as norepinephrine and dopamine. These substances may cause feelings of happiness and euphoria, therefore providing positive feedback for the extreme behavior and potentially creating a feedback loop. Ontogeny – My interest in extreme sports has developed over a lifetime. I don’t think I was born with an innate desire to jump out of airplanes. I may have been born with a slight bias towards risky behaviors but then through interactions with people who are involved with extreme sports, I became attracted to the hobby and over time, began experiencing and enjoying them more. Adaptive Value – While extreme sports may appear to be in contrast to increasing my reproductive fitness, it actually may contribute to it! If I were to die doing an extreme sport then obviously it does not contribute to my reproductive fitness. However, doing extreme sports and surviving may be a mechanism of sexual signaling to onlookers that indicates that although I engage in these risky behaviors, I am strong/smart/clever/etc. enough to survive, thus, increasing my my mating and reproductive potential because those are characteristics that increase my chances of survival. Phylogeny – This interest in extreme sports may have evolved to set myself apart from the rest. Due to an increase in education levels, income, competition in the job market, an interest in extreme sports could be an evolution due to these selective pressures. Practicing extreme sports is a behavior that is different from what is traditionally seen as a desirable characteristic in a mate, therefore, it may have evolved as an additional characteristic that may be seen as desirable. This was taken in December 2014 during a visit home. Note the complete lack of snow or any sign of winter present. I was born and raised in Las Cruces, New Mexico. It’s hard to pick out what I miss most about this gorgeous little city nestled in the desert. Perhaps it’s the overwhelming friendliness–the way that people aren’t afraid to joke and laugh with total strangers. Maybe it’s the 350 days of sunshine a year and the blissful ability to perceive the 70’s as brisk weather. Or, it might just be that little green pepper, the one that tastes like pure happiness and instantly transports me back home–Hatch green chile. I am about to make a claim that will sound utterly ridiculous to most people and completely mundane to any New Mexican: My favorite hobby is tracking down and consuming Hatch green chile. A picture of me that my roommate took at the Wegmans’ Hatch Chile Festival in Binghamton, NY in 2016. In 2010, I moved to New Paltz, NY to attend grad school for my M.A. in Psychology. In the months prior to my departure, each joyful congratulations about my move from my fellow New Mexicans was quickly followed with their condolences that I would soon be unable to easily get green chile. Indeed, I found one of the hardest adjustments to my new life on the East Coast was the difference in food. A combination platter smothered in green chile and cheese. Each time I would return home, my mom would have a combination platter smothered in green chile waiting for me in the car so that the second I was off the plane I could start to get my green chile fix. However, to my surprise, I wouldn’t have to go completely without green chile while I was in New York. Each time that I would stumble upon a place that had Hatch green chile it would be a day of intense celebration. I would quickly buy 20 pounds or more to store in my freezer to carefully portion out through the next year. Beyond just the joy of having my stash of peppers in the freezer, was the fun of getting to share this treasure with New Yorkers who had never even heard of Hatch, New Mexico. My first Hatch Chile Festival at Wegmans in Binghamton, NY in 2014. I literally wept tears of joy in the parking lot when I smelled the green chile roasting. From explaining to the perplexed employees what the hell I was planning on doing with that much green chile, to introducing my friends to the wonders of this food–these were the moments where I got to share New Mexico with New York. I would tell anyone who would listen about our cultural obsession as I channeled Bubba from Forrest Gump with my endless list of everything that green chile can go into. Through following leads and sheer luck, I was able to have a stock of green chile in my freezer for 5 out of the 7 years I was in New York. 20 lbs. of Hatch Green Chile that I acquired during my first week in Alabama. So, why do I have this obsession and can Tinbergen’s 4 questions help get at the answer? Proximal: Proximate is always the easy one. At the most basic level, I eat green chile because green chile is delicious. I continue to seek out and consume green chile because it tastes very good to me. The more interesting question, of course, is why? Functional: Before we ask, why green chile tastes “good” to me, we should really start by asking, “why do we taste things at all?” In general, it is adaptive to have keen gustatory abilities so that you can detect potential toxins. Thus, when something tastes “bad” we generally develop an aversion to it; and, lo and behold, that thing that tasted “bad” is more often than not something that could be potentially harmful to your health and should be avoided. In fact, Dr. Gordon Gallup gave a fascinating talk in the SUNY New Paltz Evolutionary Studies seminar series when I was a grad student that argued that one of the major overlooked factors in the mass extinction of dinosaurs was their inability to develop taste aversion to toxic plants. Now, to our main question. There are a couple of reasons for why I have such a positive reaction when I consume this substance. One interesting evolutionary hypothesis proposed by Dr. Jennifer Billing and Dr. Paul Sherman in the late 1990s suggests that spices (many of which are powerful antimicrobial agents) may aid in reproductive success by cleansing foods of pathogens; thus, those individuals who find these flavors enjoyable would have an advantage when it comes to health and survival since the food they consume is less likely to be contaminated. To support this hypothesis, the authors demonstrate that areas with a higher mean temperatures and thus a higher likelihood of food spoilage (i.e. pathogen contamination) also contain more spices in their cuisine. Given the hot climate of the southwest, it was likely adaptive to incorporate chile peppers into the local cuisine. Another reason for my green chile obsession is likely due to this being an in-group marker for my identity as someone born and raised in Las Cruces, NM. By eating green chile, I feel connected to my group–something that is highly desirable in an incredibly social species like humans. Additionally, it might be that demonstrating my ability to consume spicy foods is a form of costly signalling as it demonstrates pain tolerance. Phylogeny: We can also make an argument for an evolutionary legacy here. Humans have been adding spices to their food for thousands of years. Additionally, we see this cross-culturally which suggests a shared evolutionary history. In fact, in Billing and Sherman (1999), 22 out of the 34 countries examined had chile peppers in their traditional recipes. Ontogeny: Preference for green chile does depend on a number of factors related to age and reproductive state. For instance, as I’ve grown older, I have started to enjoy hotter peppers than I did as a child. Additionally, it might be that this preference for spicy foods would change depending on my current reproductive state. A somewhat controversial theory put forth by Margie Profet in the late 1980s and later expanded upon by Flaxman and Sherman in 2000 suggests that a pregnant woman’s taste aversions and cravings in the first trimester are an adaptive mechanism for protecting a vulnerable fetus as well as a vulnerable mother who is immunosuppressed in the first trimester so that she does not reject the growing embryo. This could mean that preferences for spicy foods like green chile might change during this stage. Billing, J., & Sherman, P. W. (1998). Antimicrobial functions of spices: why some like it hot. The Quarterly review of biology, 73(1), 3-49. Flaxman, S. M., & Sherman, P. W. (2000). Morning sickness: a mechanism for protecting mother and embryo. The Quarterly review of biology, 75(2), 113-148. Profet, M. (1988). The evolution of pregnancy sickness as protection to the embryo against Pleistocene teratogens. Evolutionary Theory, 8(3), 177-190.